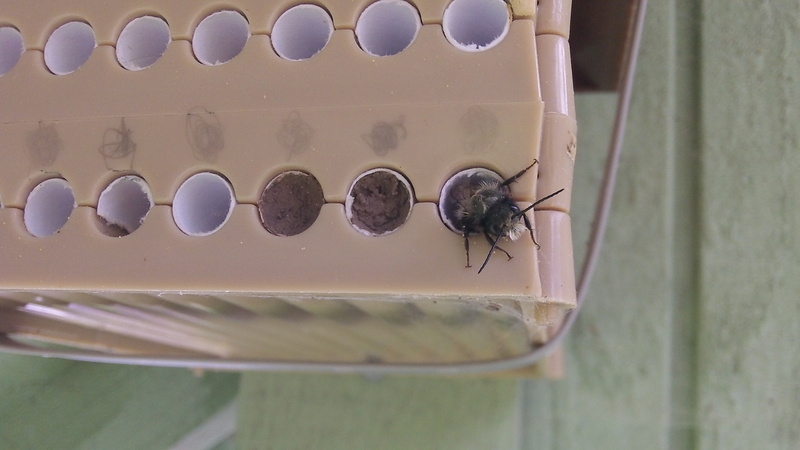 I’ve been wildly unsuccessful at launching Mason Bees, so it was with second thoughts that I again ordered a batch of bees. I’ve read so much about them. The Orchard Mason Bee, a book written by Brian L. Griffin, says (Osmia lignaria propinqua Cresson) is native to the United States and Canada west of the Rockies….is easy to maintain, fun to watch, and they are extremely efficient pollinators. This time I wanted to avoid the mistake of putting the bees out too early. The instructions were to hold them in a cool place like a refrigerator until the days’ average temperatures reached 50 degrees F. (10 C.) and the major storm season was over. I held out for as long as I could, but when my wife told me the bees were starting to hatch in the refrigerator I knew it was time to act. We looked for a south-facing wall in full sun and placed the housing under an eave on the solar shed. The perfect place to get the warmth of the sun and yet keep it protected from the south westerlies. We loaded the bees from the envelope into the bee house. We held our breath for a couple of days before we saw them flying. Mason bee in final stage of sealing up the tube. Drones (male bees) are laid last. This serves to protect the females if a wasp or bird decides to peck into the tube. (males are expendable). The next year the males emerge first and wait for the females to emerge to mate. 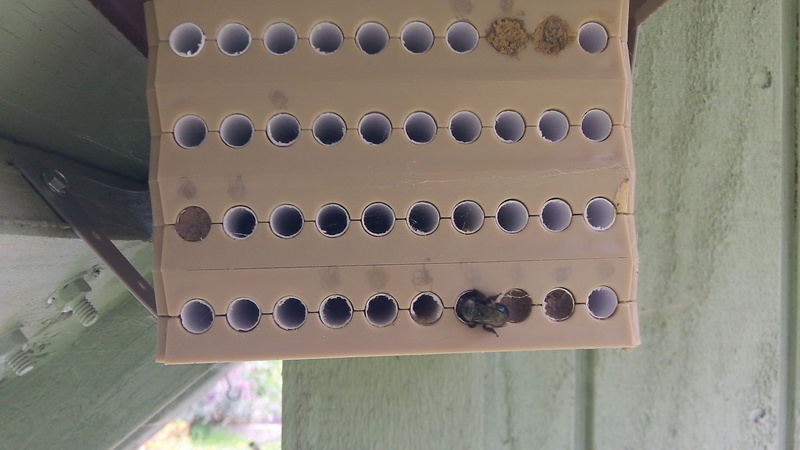 Here’s a short video showing a couple of Mason Bees entering and leaving. Hello, just want to ask were i can buy the beehive which is shown in the Video? Looks like plastic.